Lot of looking at revolvers for cc. Seems best quality size and function. My first handgun ever. Price and all great reviews! Gap between frame and cylinder is smallest compared to all others. Very good reviews for a pistol in this price range. Own a poly Judge and love the weight power ratio. Looking for something to carry on the boat in salt air conditions and figure the poly would be less to corrode as fast and be lighter in the summer if have to have on person. Plus the availability of both calibers enhance the ability of getting ammo when Its needed. I like Taurus guns.Very good quality. The feedback was all real good and at this price for this calibur, plus i really like the look and profile of it. I wasn't looking for a revolver but this looked like a very concealable gun. It was a good caliber and a good price. Can you shoot 38 SPL ammo in this pistol? BEST ANSWER: Yes, of course you can. That's all I shoot at the range mostly because the recoil doesn't kick as hard as the .357 rounds. Plus, they're cheaper to shoot. It is my understanding from the people I bought mine from that you can fire 38 rounds in all .357 caliber revolvers. Yes, you can shoot .38 Special, .38 Special P and .357 Magnum. It’s the best of all worlds and a fantastic revolver. Yes and actually preferred. Due to the weight of the taurus u will definately feel the difference. Yes, 38spl, 38spl+p, & 357 mag. all shoot well. 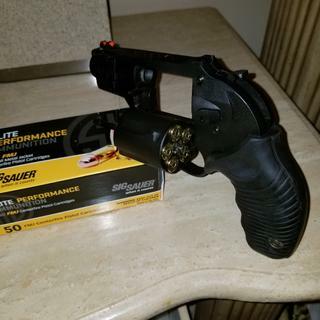 38 spl less expensive & less recoil. Definitely! Shoots better in my opinion. Less blowback and not as much kick. Absolutely. In fact, I prefer the .38 ammo; the .357 is an earthquake. Yes you can shoot .357 or .38 out of a .357 revolver. Absolutely. I have done so in mine. Yes you can. Have fun. How’s if the fit for large hands? BEST ANSWER: I have pretty average sized bands but this firearm comes with two different grips. The one you see pictured is the larger grip and it’s cushioned so it feels pretty big to begin with but not awkwardly larger for average sized hands. I’m sure there are after market grips available if you need something even larger. I think the stock grip will be fine for you though. I have medium hands, with no issues. But for larger hands, the grip texture may help. The best way is to try handling one in your local shop or outdoor store. My hands are 9 in around the palm, it fits me well. There is a fair amount of recoil when shooting 357 rounds, but I think it's quite manageable. I am 6'2" 210lbs with 10 inch tip of thumb to tip of little finger span. I find the fit excellent and recoil very manageable in my hand. The grip is long enough and wide enough to be comfortable with large hands. I wear XL gloves and the pistol fits well in my hand. As a large guy myself (360lbs. 6'5"), this revolver has a very comfortable fit, for carry and when shooting. Mine came with two grips and since my hands are on the large side I chose the larger grip and it is very comfortable. I have large hands and I use the grip that is pictured. It fits like a glove. Three finger grip is solid. Go for it. I have small hands grip is excellent for larger hands your pinky may be off a bit but grip and feel is very nice. I have large hands but not huge hands and the gun is fine.Enter an answer to this question. I'm 6'3" 260lbs and I really like how this gun fits in my hands. Great backup gun. wear XL gloves and the 605 fits in my hand great. I love shooting it! I have a medium size hands....fit perfectly to me. BEST ANSWER: The black Poly Pro has a "Black Oxide Steel" Cylinder. the weight on that firearm is rated at 20.2 oz. I personally like the look of the all black better. It’s a great fun at an awesome price point. Get the one you visually like better. The weight difference is negligible. Taurus says that it weighs 19.75 ounces, and that’s about how it feels. It’s heavier than the polymer 38 specials made by Smith & Wesson and Ruger. But, you appreciate the extra weight when firing stronger .357 loads. 20.2 ounces, according to Taurus' website. Hope that helps. It weighs 19.75oz, same as the stainless. Purchased this for on the water travels on long trips. Poly and stainless steel aids in the corrosion factor and the firearm in accurate. Trigger smooths out after several 100 rounds. grip fit me fine. Don't know who complained about the recoil but not a problem for me. This is a great little weapon that is light and easy to carry in a vehicle. These Sig 357 rounds are awesome. Recoil is manageable. Thanks. A great all. Around gun. Very light and powerful with manageable recoil. These Sig rds are great! Nice bang for your buck! Under 300 can buy you a quality built nice to shoot well designed revolver. I am going to place a order for a second one for my wife, she is 4ft 11 and it fits her hands nicely. Thanks Taurus and Thanks Grab A Gun !! Nice gun but could use better more comfortable grips. Great pistol for the price. Don't let the small package fool you. This small package should not fool you into thinking its tame because it packs a wallop but is easy to handle. It shoots 38 spl or .357 mag and with its low profile hammer is easy to carry and conceal. A great price and easily conceals ! Excellent gun. Gotta get some Wolfe springs to reduce the trigger pull. I received my pistol, read the material provided by Taurus, and cleaned it before taking it to the range. The pistol is relatively light weight and appears to be well made. The grip is comfortable and fits my hand well. I fired 100 rounds through it. The 158 gr factory ammo was punishing. The 125’s were mild by comparison. The gun was accurate and reliable. My only complaint is the 14 pound double action trigger pull. It gets exhausting. Love it, perfect for pocket carry. My first revolver my first Taurus excellent handgun excellent action excellent handling it's keeper. My favorite concealed carry weapon. Very light, a bit wider than some others, the low profile hammer allows for single action but reduces any chance of snagging, the trigger is a bit stiff, quite accurate, comfortable in the hand, a powerful self-defense weapon in a compact package. I prefer it to my M&P Shield .40 S&W and Glock 27. Shot placement and power trump capacity in most self defense situations. Solid little revolver for the price, At the range I had no problems. It shot as well as my expensive snub noses.I do like the double action choice which is not avail on some of these pocket revolvers.